Cryptocurrencies are having a rather hard time. Bitcoin’s price fell under $7000 just some months after it was around $20,000. Authorities around the world are also trying to regulate cryptocurrencies. In a situation like this, diversification might be a good idea, but does that work with cryptos? Not really. At the end of last year, news was all about how Bitcoin broke the $20,000 barrier. Fans of cryptocurrencies were all about the success, but economists and analysts worried about the bubble and expected a burst. The bubble burst and pushed Bitcoin back under $7000, and it’s still on the fall. This brought all other cryptocurrencies down as well. There are so many cryptocurrencies, it’s hard to keep count, although, some of them are more successful than others. There are market leaders in volume and value as well. (Some of them, like OneCoin may be just a Ponzi scheme.) But if we take a closer look at all those cryptocurrencies, we see that there is really only one: Bitcoin. 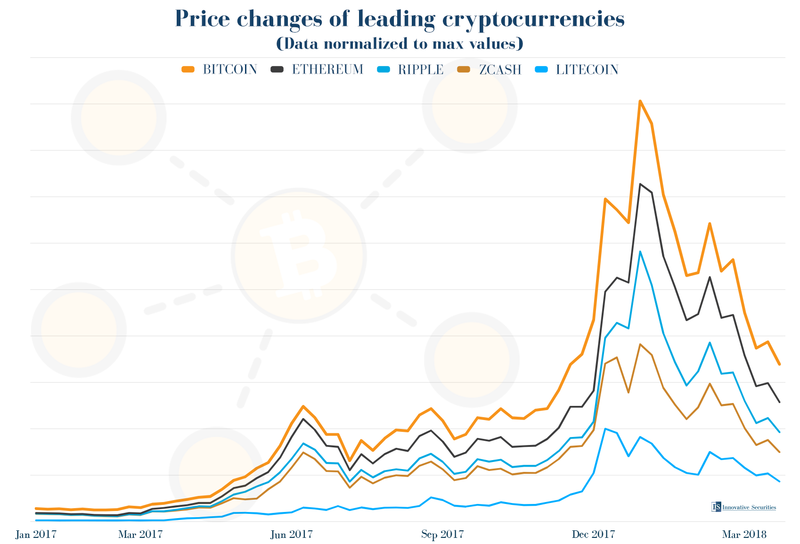 From the chart above, it’s easy to see that all major cryptocurrencies (and smaller ones as well) are following the rise and fall of Bitcoin. If the market leader cryptocurrency goes well, people buy others too and the market blooms. No one wants to miss the train, so they pour money into the market. This is called “Fear Of Missing Out”, or FOMO for short, and it’s a phenomenon that defines crypto markets. But if Bitcoin falls, the whole market gets scared and starts to sell every other coin. From the beginning of 2017, (normalized) prices are so closely connected that it’s hard to tell them apart. Transaction numbers also fell to half of what we’ve seen at the time of the highest hype in December from 490 thousand to under 150 thousand, which means that people are staying away from cryptos at the moment. Since there is only one cryptocurrency that leads the whole market, the most basic investing advice doesn’t work. We – and other serious analysts – always tell investors to diversify their portfolio. The main idea behind diversifying is that if one instrument is falling, others may balance it and keep the portfolio as a whole profitable. But if prices are heavily interconnected, this very basic idea of safe investing can’t work, since all instruments will fall at the same time. 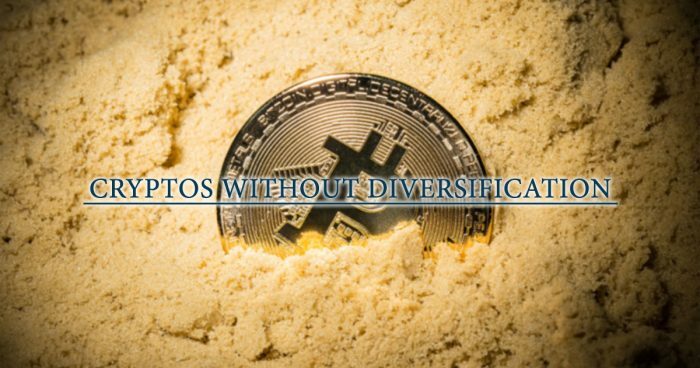 Investors could try to diversify their portfolio by buying several cryptocurrencies, but all the others will follow the price changes of Bitcoin. This means that diversification doesn’t work at all. Hard time for cryptos will not even end yet. More and more authorities around the world are trying to regulate the market. According to a Bloomberg article, virtually all countries and regions are planning to tighten regulations, as currently, trading mostly works in a legally grey area. In the meanwhile, ICOs (IPO like coin offerings with little official oversight) are openly banned in more countries since they hold the highest risk of them all. Twitter, Google and Facebook banned ICO adverts as well. Because of the heavy price fluctuations, cryptos seem to be less valid as a currency, too. Some time ago, games selling platform Steam stopped accepting Bitcoins. The reason was simple: transaction fees were too high, and price fluctuations were impossible to handle. Bloomberg also wrote, that social platform Reddit Inc. no longer accepts Bitcoin payments either. This also questions the real value of cryptocurrencies as currencies since they become less accepted as payment methods. Another (old) problem is that they don’t have any real economic performance backing them up, so their real value is at question and they can, in theory, be wiped anytime. In brief, it’s hard to see now how things could turn around for cryptocurrencies.